You may want to reset the Plays counter column on a music file that keeps track of how many times you play a file in Apple iTunes. Here’s how. 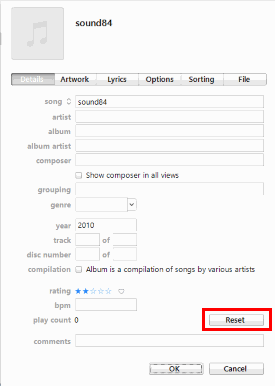 From the “Songs” list, select the music tracks you wish to reset. You can even select multiple tracks and apply the reset to more than one track. To select all tracks, choose “Edit” > “Select All” or hold “Control” and press the “A” key. Right-click any of the highlighted tracks and a menu will appear. Single mouse button users can hold “Control” while clicking the highlighted item to make the menu appear. Select the “Reset” button to reset the play count.